Kitsch /kÉªtÊƒ/ is a term of German/Yiddish origin that has been used to categorize art that is considered an inferior copy of an existing style. The term is also used more loosely in referring to any art that is pretentious to the point of being in bad taste, and also commercially produced items that are considered trite or crass1. 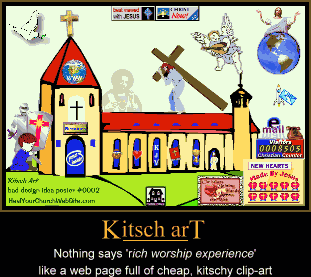 Kitsch is the term that comes to mind whenever I see cheap, cheesy clip-art gratuitously grafted into a church website. 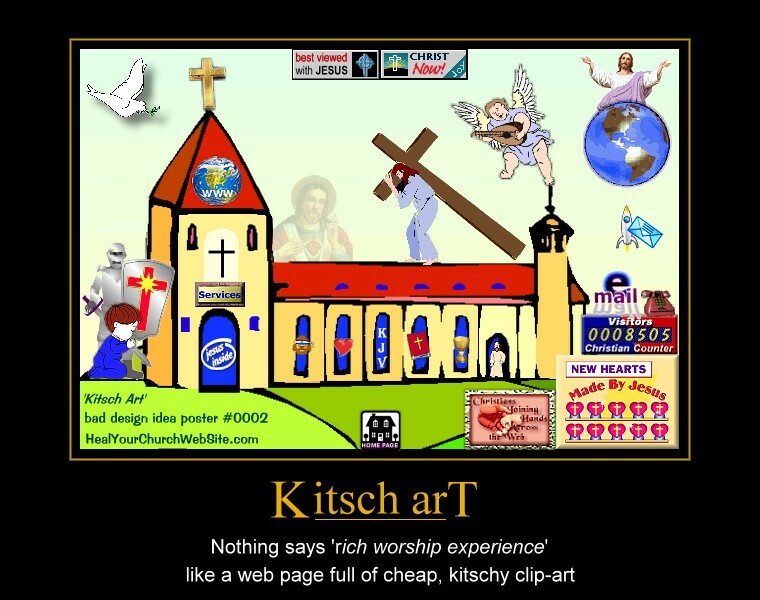 Sorry folks, but nothing conveys the antithesis of a rich worship experience than to see a website cluttered with Christian cruft in the form of spinning crosses, low-res icons and cliches art. As always, you can click on the small image to see the big image. As always, please no hot-linking w/out providing a link back here (to the article, not just the picture :-). And as always, I welcome comments, in love, if you have an idea, suggestion and/or … um … comment. I wish I had 8505 visits to my church site. I stumbled upon your site this evening. Iâ€™ve been searching the web for articles in hopes of finding the advice I needed for redeveloping our small, country church website. My goal is to revamp my old design and completely rethink the next project. I should have done that the first time huh? Oh wellâ€¦live and learn I suppose. I had to join (and bookmark) this site because I have found myself chuckling on several occasions. Many of your theories of do and donâ€™ts, combined with slapstick humor, and superb writing skills has left me hanging on the edge of my seat. I had to post under this article because one of my biggest pet peeves is all combined in your lovely artwork above. I now have a new word to add to my vocabulary, Kitsch.